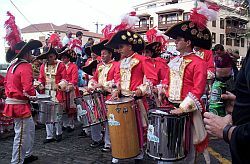 The Puerto de La Cruz Carnival is every bit a big event as the one in Santa Cruz, but the latter still remains the most famous. They are very similar celebrations, but with certain, important differences. Like the one in Santa Cruz, the carnival takes place at Easter and is centred around Ash Wednesday. Generally, it begins a day later than Santa Cruz and finishes a day earlier. This occurs the Thursday before Ash Wednesday, which, next year (2011), will be March 3rd. An important event, heralding the start of Carnival. Two days after her election, the Carnival Queen is paraded through the streets of Puerto accompanied by much noise - a lot of it provided by the groups of baterias, collections of drummers and percussionists. Thereafter, the partying gets underway, with gusto, extending well into the night. Yes, it's that strange ceremony again. 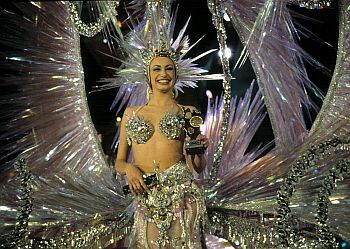 The centrepiece of the Carnival, taking place on Ash Wednesday, this involves the parading through the streets of a huge, papier mache model of a sardine. As it is, in essence, a "funeral procession", it is accompanied by hoards of "mourners" - weeping "widows" that are really men dressed up. At the harbour, the sardine is set alight and the ceremony culminates with fireworks. 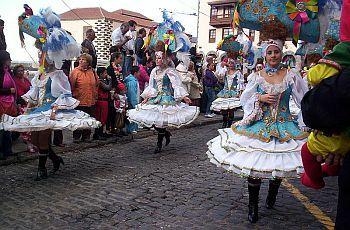 La Mascarita Ponte Tacon - the "High Heels Marathon"
Taking place two days after the "sardine", this is an event unique to the Puerto Carnival. As is often the case with these things, it involves a certain amount of risk to the participants' health. It is a race, of sorts...for men...in high heels. The rule is that the heels must be at least seven inches high (and they're all checked and measured before the race by an outrageously costumed drag act). The contest takes place in the Plaza del Charco at around 8:30pm, after the participants have consumed copious amounts of alcohol. The route for the race is littered with obstacles, such as sets of old tyres in two rows, stepladders, elevated platforms and see-saws. Contestants have to wear, in addition to the heels, the most flamboyant, imaginative costumes they can muster and, on tackling the course, they make as much a fuss of each obstacle as possible - so, it's not about speed! This event is a popular highlight of the Puerto Carnival and regularly attracts over 10,000 spectators. This is another modest ceremony unique to the Puerto Carnival. Literally, the "killing of the snake", it is a tradition dating from the 19th century, recently revived. It is represents the struggle towards freedom from slavery. Participants are dressed as plantation workers and there is another one who is fair skinned. This quality represents him as the others' boss. A "snake", representing evil, is killed with whips. Taking place the day after the "High Heels Marathon", the Carnival rounds itself off in style. As the procession passes through the streets, spectators on balconies or first-floor windows shower the entourage with confetti and streamers. 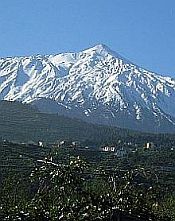 Puerto de La Cruz is twinned with the German town of Dusseldorf and, for the last 25 years, a delegation from this town has travelled to Puerto to take part in the final parade. Thereafter, the party goes on well into the night.